We woke up this morning, September 14th, overlooking from our balcony where we could observe monkeys in the trees, zebras crossing, elephants passing by our lovely lodge. We had a wonderful breakfast. After breakfast we went on a game drive and our driver David, who has remarkable eyes, was able to give us the ultimate experience in finding a leopard in a tree, and getting up as close as we possibly could. 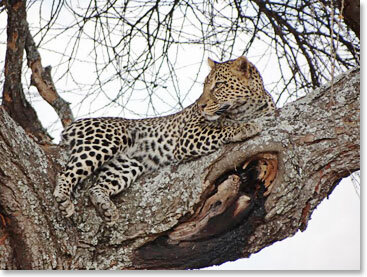 It was a fabulous, wonderful, exciting, and exhilarating moment, really cool to see the leopard. Later on "eagle-eye" David was able to find a pride of female lionesses. So, what a morning to see two out of the “Big Five”! (Note from BAI office: the "Big Five" are Lion, Leopard, Buffalo, Elephant and Rhino.) 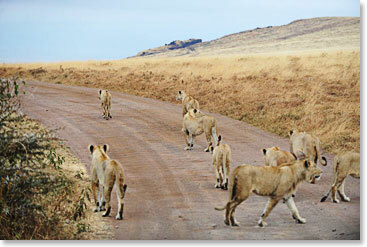 We have completed our game drive now and we are on our way to Lake Manyara where we should arrive in about two hours. So safari has been really super fun, great. “Jambo” to everybody. Bye!